a Russian grenadier is being taken prisoner. In the March 2008 issue of Armchair General magazine, our cover story was “History’s 100 Greatest Generals” written by Brian Sobel (author of The Fighting Pattons) with Jerry D. Morelock, PhD (Armchair General magazine’s Editor in Chief). The list of these one hundred Great Captains of military history was prepared with the assistance and advice of our magazine’s Advisory Board members, including the acclaimed biographer and historian, Carlo D’Este (author of Patton: A Genius for War and Eisenhower: A Soldier’s Life) and Gen. ret. John W. Mountcastle, formerly the U. S. Army’s Chief of Military History. Our goal in this article was to scour the pages of history – covering over 3,000 years of warfare, from 1200 BC to the present – and in every corner of the world in order to make our selections as comprehensive as possible. Presented chronologically, our list runs from Joshua, the ancient Israeli warrior, to Mao Zedong, China’s legendary guerrilla leader, and includes the “greatest of the great” of the military commanders who have shaped world history. Yet, since the magazine article does not single out which one of these “100 Greatest Generals” was the “greatest of the great,” our publisher, Eric Weider decided to pose that question to our readership. He directed our Armchair General magazine web master, Mr. Brian King, to create a means of letting our readers decide, collectively, who the was the greatest general of all time. Mr. King created an on line, head to head competition at our popular website (www.armchairgeneral.com) that allowed readers to log on and cast their vote for who they thought would win in a clash between these great commanders. This competition took the form of individual head to head ‘virtual battles,’ which matched each of the great generals against another. For each head to head competition, readers voted for which general they thought would win. The winners of each of these contests then moved on to ‘fight’ the other winners (much like the NCAA college basketball tournament) until finally there were only two undefeated ‘champions’ remaining to face each other in the final contest. This process took about 3 months to complete, and thousands of readers, military experts and those having an interest in military history cast their votes. The final on line ‘battle’ pitted American Civil War general and two-term US president, Ulysses S. Grant, against Napoleon, the military genius who so dominated his time that his name was used to designate an entire historical era. 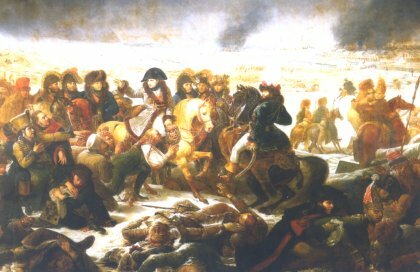 The results of that final vote showed a far from equal contest – Napoleon won in a huge landslide! His victory clearly shows that Napoleon must rightfully be considered the “greatest of the great,” the most skilled, influential and brilliant military commander in history. Napoleon not only dominated military operations during his own historical era, he is simply the greatest of all of history’s Great Captains.